Quilter's Academy Vol. 1 Freshman Year 10662 by Harriet Hargrave and Carrie Hargrave. This book is well presented for both the beginning patchworker and the more experienced quilter. Harriet Hargrave and her daughter, Carrie, explain all aspects of the materials and equipment needed to get started with this craft and clearly present instructions for making your first blocks and putting them together to make a quilt. The book is set out in classes, within each class there are a number of lessons each covering a different topic accompanied by photographs to show how the finished projects will look in a variety of colourways. There are plenty of practical projects to be completed from table runners to quilts using a variety of blocks and skills and there are many tips along the way which will help even the most experienced quilter but this book would be of most use to beginners and those seeking to pass on the skill of patchwork to others. 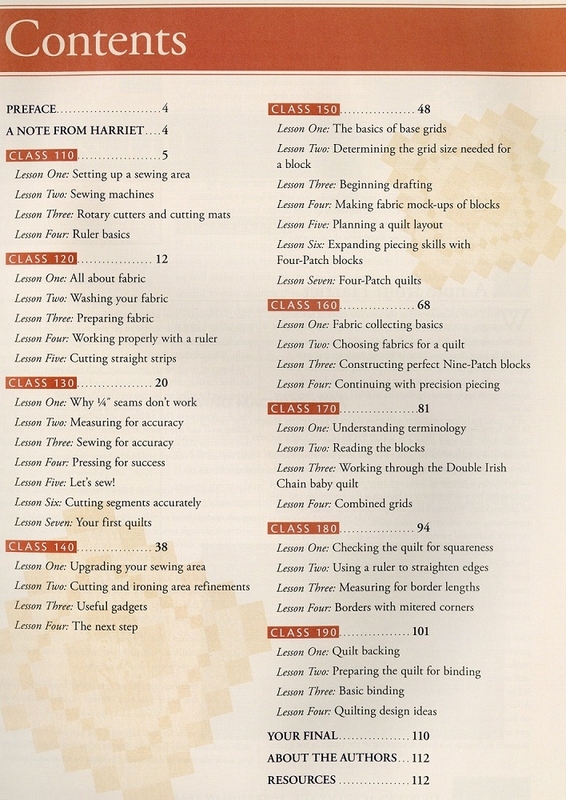 This first volume in a planned series of six books from veteran quilt educator Harriet Hargrave and her daughter Carrie covers the basics of quiltmaking in nine classes, each of which includes four to seven lessons. The book does not focus on projects - though there are plenty of those. It focuses on the why's and how's of the quiltmaking process. 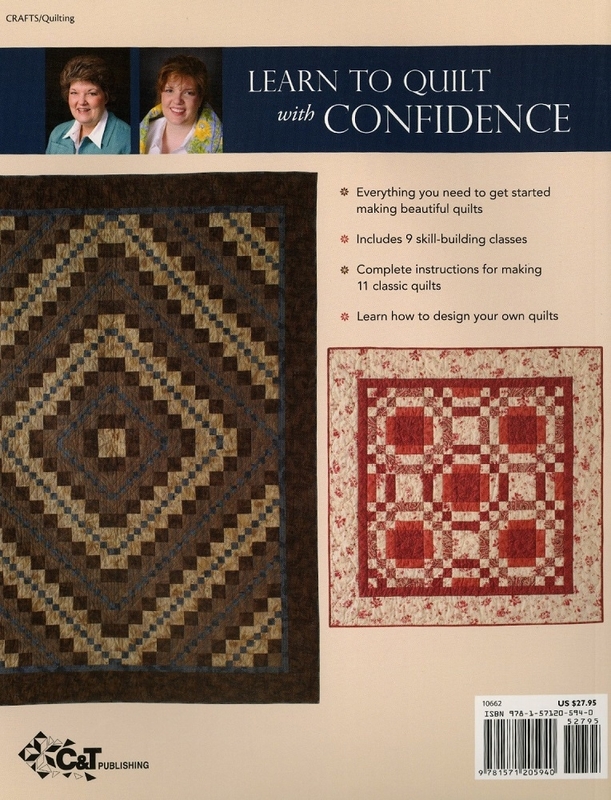 It's a first-rate book for quilters of all skill levels. This perfect guide to the fundamentals of quilting for beginners is filled with tried - and tested techniques & expert advice. This must-have course guides beginners step-by-step through the fundamentals of quiltmaking, from setting up a sewing space to binding and finishing their first quilts. Featuring tried-and-tested techniques in 9 skill-building exercises, complete instructions for making 13 classic quilts, plus hints and tips for designing your own quilts, this is a must-have volume for anyone wanting to get to grips with the basics of quilting. You are holding the first in a series of six books. 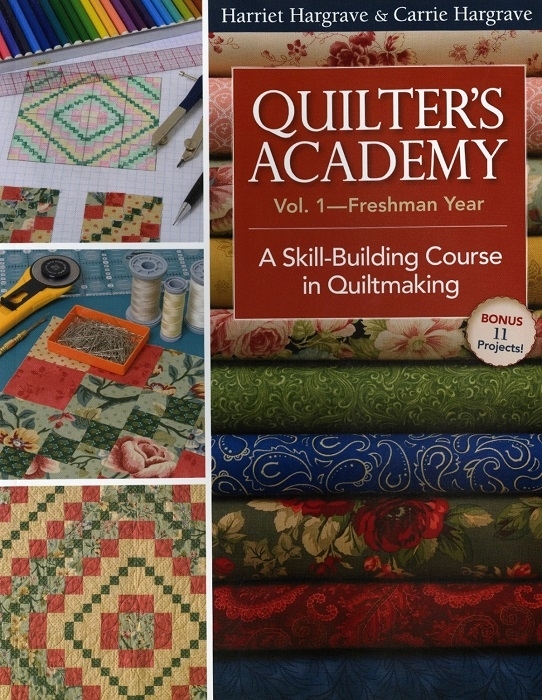 The purpose of the series is to build your quiltmaking skills--from beginner to advanced--on a firm foundation. This first volume is to be used as a workbook. It contains a complete sequence of classes, lessons, exercises, and projects that will build your skills from one project to the next. We highly recommend that you make the quilts in the order presented, as we have placed them in order of complexity. Each quilt offers new challenges and involves new techniques that will help you continually build your skill level. We have chosen designs that are timeless and very adaptable to traditional fabrics as well as to more trendy fabric and color choices. Use these quilts to explore your color and style preferences. This book and the next in the series deal with quilts made of strips and squares. By mastering the techniques presented in these first books, you will be laying a foundation for precise, high-quality piecing. There are hundreds of quilt designs based on strips and squares, so you can spend a long time exploring these stunning quilts before you jump into the more complex piecing featured in the following books. Everything you need to get started making beautiful quilts Includes 9 skill-building classes Complete instructions for making 13 classic quilts Learn how to design your own quilts. Learn to quilt with absolute confidence: this skill-building course shows you how. As a freshman, you'll learn the basics, from washing and preparing your fabrics, to sewing up 11 classic quilts. A skill-building course in quiltmaking. Everything you need to get started making beautiful quilts. Complete instructions for making 11 classic quilts. Learn how to design your own quilts.